The second that you complain about an eBay seller who’s taken money but hasn’t delivered the goods, an investigation team gets in gear. The Resolution Center is where you can go to file a formal complaint when you run into trouble with a transaction. The first step is to get in touch with the seller and see if he or she will work things out with you. You can e-mail your seller through eBay’s Message Center, or call the person directly. When you’re in a transaction with someone, eBay will give you that person’s registered phone number. Go to Advanced Search and in the Members area, select Find Contact information. After you input the other person’s eBay ID and the item number, eBay e-mails you the person’s phone number. 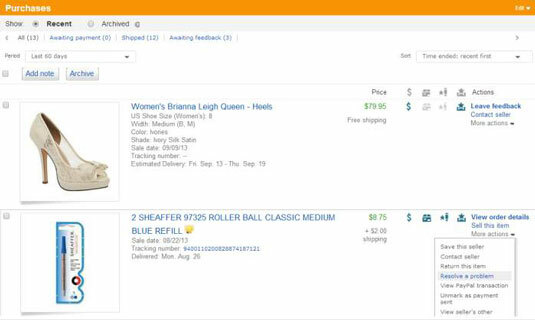 In the Purchase History area, click the link to take you to the items you’ve purchased. Scroll down the page to find the item in question and choose Resolve a Problem from the pull-down menu at the far right. The Resolution Center’s Resolve a Problem form appears. Choose the problem you’re having in your transaction and click Continue. Now you get to the Report an Item Not Received or Not as Described form. If you arrived at the Resolution Center from your item listing, your item number is already filled in. If needed, enter the item number. Tell eBay how you paid for this item. If you paid by PayPal, you are sent to the Resolution page. Review your case details and then click Open Case. The Your Case Is Now Open page appears and tells you that your trading partner has been notified and has ten days to respond. From here on, you can continue your dealings in the Resolution Center. To file a claim with eBay, you must initiate the complaint process no sooner than 7 days and no later than 45 days after the close of the listing. Be careful not to jump the gun and register a complaint too soon. Wait about 2 weeks before you register your complaint about an Item Not Received (an item lost in the mail can often take as long as 30 days to arrive); double-check first to make sure that your e-mail is working and that you have the correct contact information of the person with whom you’re having difficulties. After all, neither eBay nor your ISP is infallible. After you register a complaint, eBay informs the other party that you’re making a claim. eBay says that it will try to contact both parties and help reach a resolution. Registering the complaint is not the same thing as filing an insurance complaint. Registering starts the process; filing for a refund comes after a grace period if the situation isn’t resolved. If you’ve clearly been ripped off, use the Item Not Received or Significantly Not as Described process to file a complaint. Just scroll to the Links area at the bottom of the page and click the Security Center link. If the accusation you’re registering is a clear violation, eBay gives you information on the kind of third-party assistance you can get to help resolve the problem. If eBay deems the problem a violation of the law, it reports the crime to the appropriate law enforcement agency.